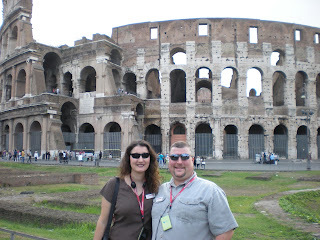 Two years ago at this time, we were gearing up for our trip to Italy for Steve's 40th birthday. We had been (and have been) struggling financially, but I'd saved up all of my tip money for a little over three years because I wanted to make this trip happen for him. He had no idea until I told him in February, because I wanted us to be able to plan this trip together and be sure it was everything he wanted it to be. I wish we could go back right now. It was beautiful, incredible, and nothing could possibly compare to such an experience. My hope is that, someday, we'll be able to travel much more often and experience such things as this. I never thought it would be on the horizon. Now, I find myself in the midst of learning a new and more lucrative career, and I would describe myself as slightly overwhelmed but completely invested. This week, there was an open house at the office for all of the writers, advertisers, and friends of The FAMILY Magazines. I met quite a few people and could put faces to names that I'd been hearing and writing to for over a week already. I received my business cards... BUSINESS CARDS! *gasp* and put them in my business card holder that Steve Russell, one of our actors for "Into the Woods", got me as a cast gift. For the first time in my life, I can foresee a light at the end of the tunnel. We're no longer in debt, but this means that we can start saving for the future and moving up. I know that, in the grand scheme of things, materialistic things in this world are not important. I just want to be able to provide for our children, to educate ourselves more and more, and to be able to travel and see the world. None of that is as important as helping others, and that's my biggest goal. Last night, we attended the celebration for Rob and Michelle Wegner, one of our pastors at Granger Community Church, and his wife. They have served our church together for 20 years now, have three children, a strong marriage, and a love for others that is unparalleled. I was blown away by the outpouring of love not just from our church members, but from other communities as well. The number of lives that Rob and Michelle have touched is nothing short of a miracle. From Granger, Indiana to the country of India, they have been instrumental in the movement I wholeheartedly believe in -- loving people right where they are, and letting God do the changing. They are humble in heart and demeanor, they are unconditionally loving, they are fun and friendly, and they are willing to do anything to get more people to Jesus. I am in awe at how devoted they are in their Journey, and more than pleased that God brought them into our lives, and us into theirs. We met Rob in 'real life' in the coffee shop, and he was so real and genuine, and exactly what a pastor -- or any person -- should be. He brought Michelle in shortly thereafter and we got to meet her as well. They both attended the open house on Thursday for FAMILY (as Michelle is one of our very talented writers) and we told them we were going to see them for their celebration, too. We were almost unable to do so, since a conflict came up at Steve's job, but in the end, it happened, and MAN, were we glad it did. It's a rare occasion that we feel full and inspired. Attending the celebration for Rob and Michelle was something we wanted to do, but closing in on the actual time to go, when we thought we weren't going to be able to make it, I was very upset. I wanted us to be there as a family. I could have still attended without Steve, but I told him if he couldn't make it, I didn't want to go without him. At the last minute, we were able to go, though it took some quick changing and driving. The entire celebration itself was worth it, but the end of it was nothing short of miraculous. I've rarely seen my husband as 'fired up' as he was when he saw John Schlitt from Petra walk out onto the stage. I could see how excited Rob was, since he didn't know it was going to happen -- none of us did -- but my husband was just as thrilled as Rob was, nearly in the back row. I could tell he needed the inspiration, and nothing makes me happier than seeing him inspired. I'm so grateful for Granger Community Church. God completely transformed the trajectory of our lives when we began attending there eight years ago, and I am so thankful every day of my life that He led us there and worked on us while we've been there. More and more, good things are happening, and all the glory is His. Being out of debt has got to feel fantastic, hope that life continues to bring you positive things!